Off The Rails: Strike-Hit Bay Area Struggles With 'Horrible' Commutes : The Two-Way A strike has shut down the San Francisco area's rail system for a second day, stretching out commute times and confusing tourists and residents alike. Many people who rely on the system say they wish labor and management could just settle. 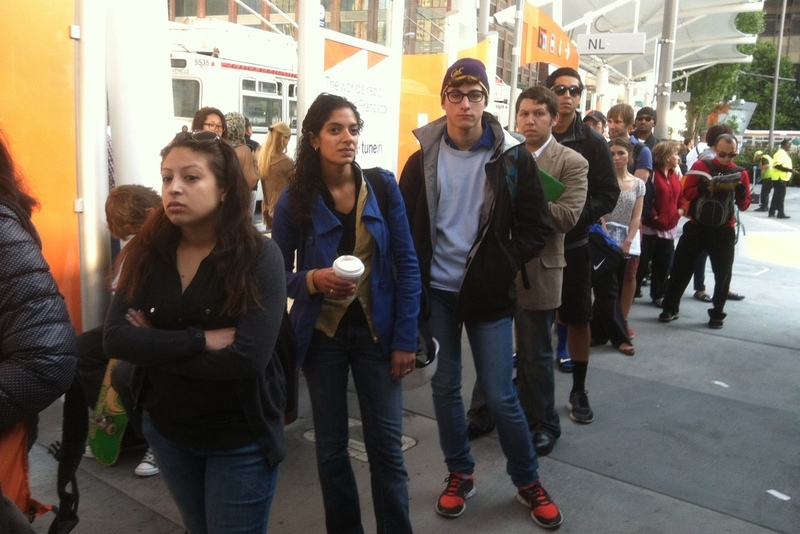 Frustrated commuters wait at the Transbay Temporary Terminal in San Francisco to catch a bus over to Oakland on Tuesday. Andrea Brearley's kids really want to see Pixar while on vacation. The problem is that the family is staying in San Francisco, and with rail workers on strike, they're having a hard time figuring out how to get to the cartoon-maker's headquarters across the bay in Emeryville, Calif.
Brearley, who lives in Windsor, Ontario, says it's been "scary" trying to figure out an alternative route. "Three different people told me three different buses," she says. In fact, many of the natives are confused. The area has multiple transit agencies, but the Bay Area Rapid Transit system links a number of them, serving an average of 400,000 riders on weekdays. Many people who rely on the system say they wish labor and management had been able to resolve issues of salary and benefits well ahead of Sunday night's deadline. "I mean, I don't have time to get this cup of coffee," says Nadya Oks while waiting in line at a San Francisco Starbucks. She doesn't normally rely on BART, but her schedule was thrown off Tuesday by an hour anyway, with her regular AC Transit bus from Oakland delayed by traffic. The Transbay Temporary Terminal, which is the main bus transfer hub in downtown San Francisco, is at the corner of Howard and Beale. Some people there are feeling like Howard Beale, the character in the old, non-Pixar movie Network, who is mad as hell and not going to take it anymore. "It's horrible," says Esther Davis, who lives in Daly City, just south of San Francisco. Normally, she hops on BART and crosses over to Oakland in about half an hour. Yesterday, the same commute using a series of buses took her 2.5 hours. Some downtown San Francisco companies have allowed workers to adjust through telecommuting or time-shifting. Some have set up in-house carpool lists. Jennifer Taylor, an intellectual property attorney, normally joins an Oakland carpool line at 7:30 a.m., but on Tuesday she got there good and early, at 6:20, just in case. "The line for the Bay Bridge was backed up," she says. "Anyone who doesn't live in the city is struggling to get in or is working odd hours to avoid the commute." Like in many places, commutes in the clogged Bay Area can be voyages of despair on an average day. Monday's traffic wasn't as bad as feared. Fewer cars actually passed through the Bay Bridge toll gates from 6 a.m. to 10 a.m. than on the previous Monday. 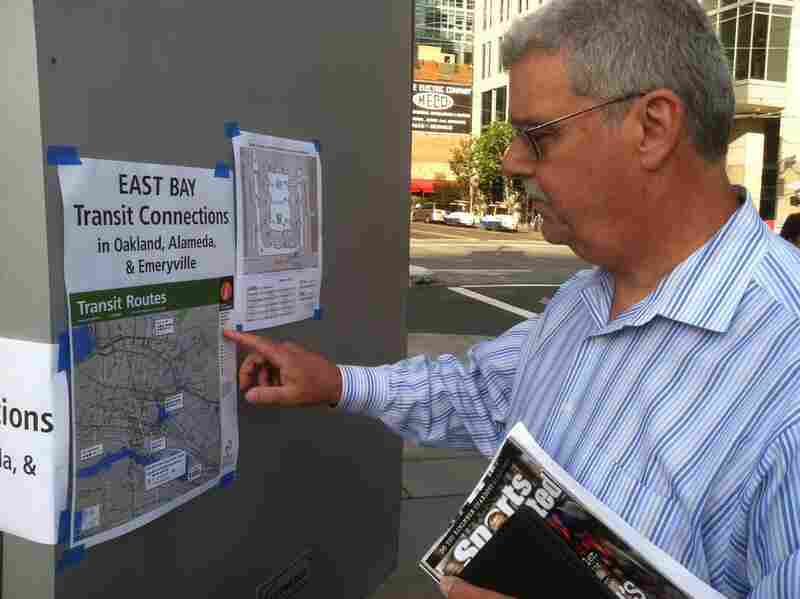 "Everyone's been really pleasant," says Stephen Newhouse, a planner for AC Transit who was helping guide confused commuters Tuesday at the Transbay Terminal. "I think everyone understands we're all in this together." IT consultant Gerard Alessi tries to figure out his way home from his office in San Francisco back to suburban Concord on Tuesday. Anyone can put up with some inconvenience for a day. Even some people sympathetic to the striking workers, though, worry that the strike may linger for days. Davis says she's learned to take her usually pleasant commute for granted. 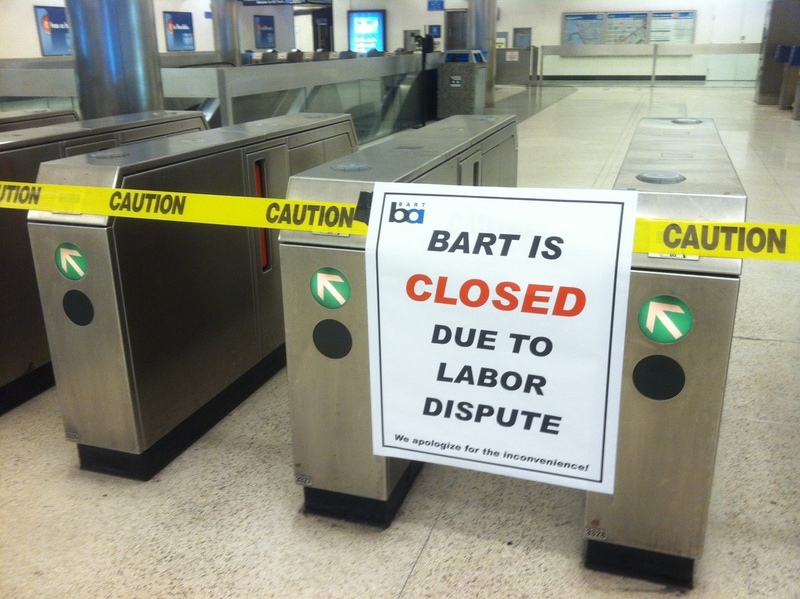 Like a lot of people who've been put out, she doesn't so much blame the striking workers or BART's management as express frustration that they weren't able to resolve their dispute well ahead of Sunday night's deadline. "I'm a little angry at both sides, that they couldn't reach some common ground and settle it," says Gerard Alessi. The IT consultant normally commutes to San Francisco from suburban Concord by BART. On Tuesday morning, he caught a ride at 5:30, about three hours earlier than he usually leaves the house, to get on the Oakland ferry. Melvin Quan, who relies regularly on the ferry, wasn't so lucky. On Monday, he had to wait 90 minutes to get on. Tuesday, seeing that the line was about 25 percent longer, he improvised. He helped organize an impromptu carpool with three other men in the ferry line. One of them drove to San Francisco and the four of them split a $25 parking fee. Quan says he'll try the ferry to get home, but will likely have to leave his job as an insurance underwriter an hour early to do so. "It will hurt my productivity," he says. "The city's hurting because of this. The BART and the transit system is a vital part of our infrastructure, and without it our economy cannot run."